On the 15 to 17th of February 2018 International Congress on electrical stimulation and clinical electrophysiology of heart XIII “Cardiostim 2018” took place in St. Petersburg. The Congress was held at the Park Inn by Radisson “Pribaltiyskaya”. The event has became a historical milestone for its organizers, permanent participants and all members of the medical community, as the first “Cardiostim” occurred in 1993, which was 25 years ago. The northernmost megapolis in the world has united specialists involved in the diagnosis and treatment of arrhythmias and conduction disorders of the heart for a quarter of a century, providing a platform for experience exchange, professional discussions and educational events, which are indispensable for the development of the specialty. The first “Cardiostim” gave a powerful impetus to the development of Arrhythmology in Russia, as it allowed to fully join the international experience and united all Russian specialists of Arrhythmology for the first time. Since then the Congress has traditionally been held with the participation of specialists from the European Association of cardiologists and under the patronage of the Ministry of healthcare of the Russian Federation, the Russian scientific society of Arrythmology (RCCA), scientific society of cardiologists of St. Petersburg named after G.F.Lang, the healthcare Committee of St. Petersburg. The co-presidents of the Congress "Cardiostim-2018" are the Director of the Institute of surgery named after Vishnevsky, academician of RAS, Professor and the President of RCCA Amiran Shotaevich Revishvili and the rector of FPSMU of St. Petersburg, academician of RAS, Professor Sergey Fedorovich Bagnenko. The co-chairs of the scientific organizational Committee are taken by the Vice-presidents of RCCA, the Director of NRMC of Tomsk, academician of RAS, Professor Sergey Valentinovich Popov and academician of PASI, Professor Dmitry Fedorovich Egorov. The scientific Committee of the Congress consists of the leading specialists of the largest medical centers of Russia and in the world. The Congress brings together professionals of many related specialties – Cardiology, Arrhythmology , cardiac surgeons, specialists in endovascular methods of diagnosis and treatment, doctors of functional diagnostics, ambulance, engineers-developers of the medical equipment. The main theme of the Congress, surgical treatment of complex arrhythmias and conduction disorders of the heart, is one of the most significant social problems of the modern healthcare. The exponential growth of surgical interventions of different kinds in life-threatening tachy- and bradiarhythmia in Russia has already led to important clinical results, but there are still many problems in meeting the needs of the population in these types of medical help ahead of the professionals. A scientific practical event like the Congress "Cardiostim" makes a great contribution to the development of this area. The form of the Congress has undergone a number of significant changes regarding time requirements, the increase in the number of the participants and the emergence of new technological and educational opportunities. At the present stage the audience of the Congress consists of more than 1,500 participants. The number of scientific events of Congress 2016 demanded 12 halls, working in parallel each of the three days of the Congress. Every year there appear new sections and satellite symposiums, reflecting the emergence of new technologies for the diagnosis and treatment of disorders of cardiac rhythm and conduction heart in the program. Traditionally, year by year the Congress unites several thematic conferences, and this time there will be Russian conference on electrical stimulation and electrophysiology of the heart XIII, Russian Symposium "Diagnosis and treatment of children’s arrhythmias " XI, International Symposium "Electronics in medicine. Monitoring, diagnostics, therapy" IX, Russian Symposium on problems of the diagnosis and treatment of the dysplastic heart IV. The exhibition of modern medical equipment and pharmaceutical products of leading foreign and domestic manufacturers is an essential part of the work of the Congress. 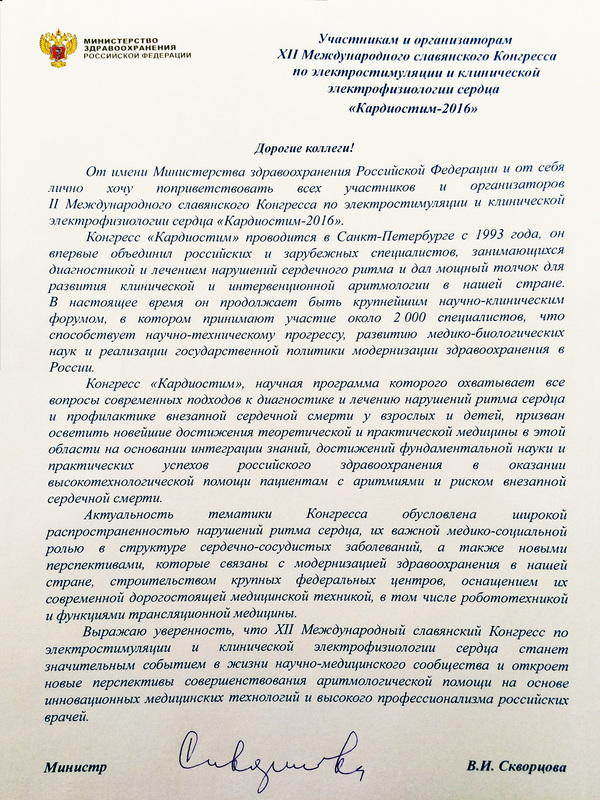 Official greeting of Minister of Health Skvortsova V. I. to the Participants and organizers of the Congress "Cardiostim-2016"
Thesis text cannot exceed 2000 symbols. Please insert the illustration links into the text. Attach the illustrations in the next part of the form. If your thesis contain tables, attach them to the form as illustrations or text files and insert their links into the text. To enter the personal account, registration and abstract submission of applications you need to be authorized on the site. If you have successfully registered, use the login sent to you by e-mail. If the stage of registration has not yet passed – send a request to participate in the congress. To reset your password fill in your registration e-mail. If you are not registered yet, send Congress Membership application.